From the moment President Barack Obama took office, he has emphasized the importance of dealing with climate change. He's said that the right way to do it is to pass congressional legislation that would cap greenhouse-gas emissions. But eight months after the House of Representatives passed a cap-and-trade bill, similar legislation remains mired in the Senate, its chances of passage dimming by the day. With midterm elections not far off  threatening serious losses in Democratic seats in Congress  it's reasonable to wonder whether the carbon-capping bill will ever become law in the U.S. But there is a Plan B. 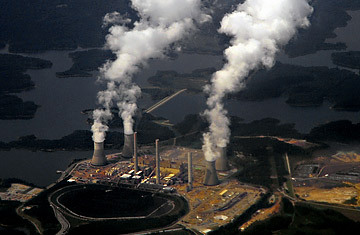 In 2007, the Supreme Court ruled that greenhouse gases like CO2 could be considered pollutants and gave the Environmental Protection Agency (EPA) the power to regulate them under the Clean Air Act. Although that authority went unused in the waning days of former President George W. Bush's Administration, the Obama EPA has spent much of the past year preparing the groundwork for regulation. In the absence of a climate bill, the EPA has the power  and is legally mandated by the Supreme Court  to step in and address carbon emissions. Problem solved, right? The trouble is that as controversial as cap-and-trade legislation has become, EPA regulation is an even bigger political minefield. Republicans are universally against it, claiming that clumsy top-down CO2 regulation will kill American jobs by strangling power plants and other industry. Senator Lisa Murkowski, a Republican from Alaska, introduced a bill late last year that would explicitly prevent the EPA from regulating carbon, and she already has 40 co-sponsors. Many Democrats also have their doubts  eight Democratic Senators from coal-heavy states sent a letter on Sunday, Feb. 21, to EPA administrator Lisa Jackson listing "serious economic and energy security concerns" with greenhouse-gas regulation. Other skeptics have used recent revelations of a few errors in the work of the Intergovernmental Panel on Climate Change (IPCC) to attack the very notion of global warming and the basis for the EPA's ruling that CO2 is a human health hazard. "The EPA's endangerment finding rests on bad science," Oklahoma Senator James Inhofe, a Republican, said at an annual Senate hearing on the EPA's budget on Tuesday, Feb. 23. "The EPA needs to start over." Both Jackson and President Obama have emphasized many times that they would prefer that Congress take the lead on climate change; many assumed that the mere threat of the EPA's regulatory authority would goad Congress into action. Now the question is, If the Senate won't move, can the EPA act effectively? Jackson has already begun to outline how greenhouse-gas regulations might work. Responding to the concerns of Democrats, she emphasized in a letter on Monday that only major sources of greenhouse-gas emissions would be subject to regulation before 2013, and that smaller emitters wouldn't be regulated before 2016. That decision seemed designed to blunt criticism that top-down regulations could negatively impact small-business owners, not just major power plants and factories. "I share your goals of ensuring economic recovery at this critical time and of addressing greenhouse-gas emissions in sensible ways that are consistent with the call for comprehensive energy and climate legislation," wrote Jackson. Still, it's far from clear exactly how the EPA will regulate carbon. Regulations would call for new plants to take on the "best available technologies" to control carbon emissions, but the EPA hasn't specified what those technologies are. Already-built sources of emissions could be even tougher to regulate  the Clean Air Act grandfathered in existing coal plants. And the agency is already facing lawsuits from the state of Texas and from industry groups that seek to prevent the EPA from issuing any regulations at all, arguing that the recent problems in climate science undermine the agency's original endangerment finding. For all those reasons, the White House would much rather see Congress take the lead  and the political heat  on climate change. But the EPA's Jackson, at least, seems ready to fight. At the Senate hearing Tuesday morning, she tangled with Republican climate skeptics and emphasized that the Supreme Court required her agency to act. "The science behind climate change is settled, and human activity is responsible for global warming," she said. "That conclusion is not a partisan one." That's true, but just about everything else in Washington still is. See the top 10 green ideas of 2008.